Here's a message about cleaning tiles, I had yesterday from Deborah In the US. If it is a just a few spots and your floor tiles have a good hard surface that won't scratch easily,cleaning tiles like this should be easy. Try rubbing them with a kitchen type stainless steel scourer pad. 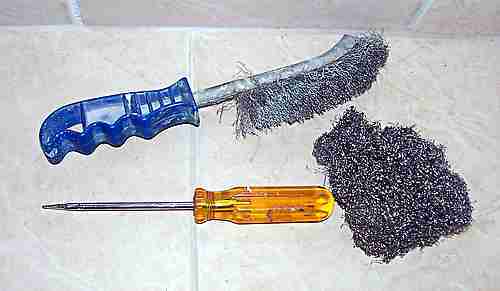 Or if you still have a few larger lumps try scraping with a blunt screwdriver to get the worst of and then the scourer. Sometimes a SS wire brush can get them off too, but as with all these things, take it easy at first, test it out. I have had the wire brush itself leave marks on tiles too, so as I say take it easy. I use the stainless steel scourer and brush all the time because of course they dont rust, so I can use them wet without fear of next time leaving rust marks behind. If you have a lot of hard grout or tile adhesive on them, cleaning tiles like this calls for extreme measures. What the tilers use as a last resort, is diluted Hydrochloric Acid, also known as Muriatic acid. This acid eats at the cement base of the product you are trying to shift. You can buy it a builder's supply shops, and I have even bought small containers of it from swimming pool shops. Do the diluting of the acid outside in the fresh air. Wear apropriate clothing, eye protection and rubber gloves. Check the dilution rate on the bottle or get advice from someone who knows, because you could have any strength of acid. It is sold usually at around 30% dilution and 70% dilution. I would say dilute the a very small amount of the 30% stuff 3 to 1 for a small trial section. I have tried it neat and it has melted the bristles on my brush, within a few minutes. Always pour the acid into the water, the other way around the larger volume of acid reacts violently to the first few drops of water and splashes of it could get everywhere. Open the doors, windows, extractor fan if you have got one, to give you ventilation. The fumes are dangerous. There is (or should be) a chemical reaction going on between the cement and the acid, you will see the surface of the grout spots bubbling of fizzing. Wear protection, for eyes, breathing and rubber gloves and old clothes and boots. Do a very small spot at a time and observe how it goes. I would use a small cheap bristle brush and dab a spot on at a time. When the bubbling stops wash it off with water, and try the spot with your scourer again and with a bit of luck it will come off easily. Doing a small section at a time you will be working safely and in control. Wash clean and wash again, get rid of all traces of the acid. Deborah, don't let the warnings put you off. I have to warn you about the dangers because every now and again a young guy goes into a room with a few liters of 30% acid, sloshes it around in this confined space and then rushes out seconds later with his eyes streaming tears and coughing and spluttering. Doing a trick like that is dangerous, not only to the health of people involved, but it can cause unseen damage to the building structure. The acid, and acid/cement fumes can start off the process of deterioration and rusting in most building components. Best of luck with it, I hope you will shift the spots easily with a scourer, quicker than it has taken me to write this. leave this cleaning tiles blog and go back to Talk and Tips Blog page.